When President Obama announced the plan for high-speed rail in the United States, he created a frenzy among transportation activists. Various sources have noted that the conversations about high-speed rail have since then been seemingly forgotten by the public, except for the consideration of HSR in California. Although there does not seem to be as much zeal surrounding the topic of HSR as there was in 2008, nothing about the importance of high-speed rail has changed. Emy mentioned this loss of excitement with a tone of disappointment, but continually pointed to the book as the spark to ignite the public’s desire for high-speed rail. The benefits are too numerous to ignore or to forget about. High-speed rail will create possibilities in travel and transportation that have the potential to be as revolutionary as the Transcontinental Railroad that sparked the Industrial Revolution. Not only will there be a faster and convenient alternative to enrich the traveler’s experience, but high-speed rail is an investment that will eventually boost our economy by creating millions of jobs. 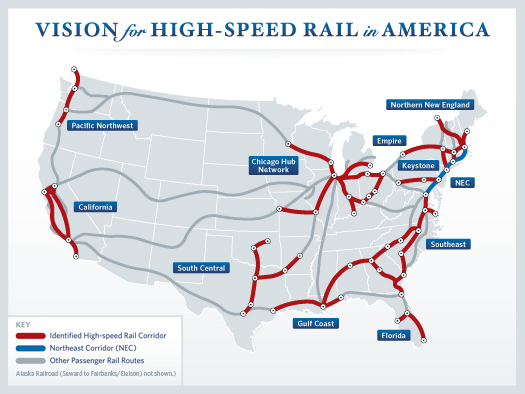 That only scratches the surface of how high-speed rail will change America. In Fast Trains: America’s High Speed Future, the authors compellingly describe through narratives and personal testimonies how high-speed rail has influenced people in other countries, and they use their expertise on the topic to relate the benefits to the United States. “If you wanted to learn everything there is about high-speed rail, you could pick up this book and learn a lot very quickly,” said co-author Nancy Bolts. Emy and Nancy emphasized that the book is for the public, and it is just as factual as it is entertaining. “I want to communicate to the average person,” said Emy. Emy and Nancy hope to urge the general public not to forget about these crucial issues in our economy and in our country. Their book is a vital tool. It will serve as a continual reminder of a system we so badly need. This entry was posted in Energy and Sustainability and tagged alternative transporation, bullet train, CAHSR, California, Emmy Louie, Emy Louie, fast trains, Fast Trains: America's High Speed Future, high speed rail, high speed rail book, high speed rail books, High Speed Rail Plan, high-speed rail advocate, hsr, Nancy Bolts, Obama, trains, transporation, ushsr. Bookmark the permalink.